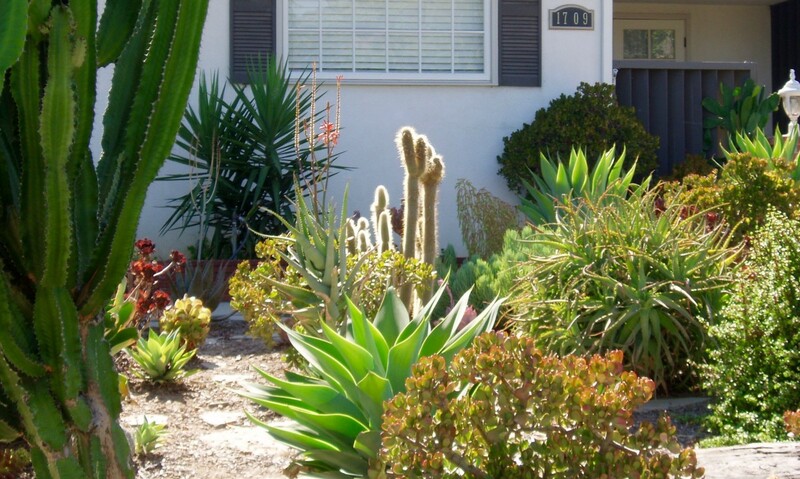 Walking around the area where I live, I've seen garden after garden filled with drought-tolerant plants that look ugly and others that look gorgeous. The difference is in the design. 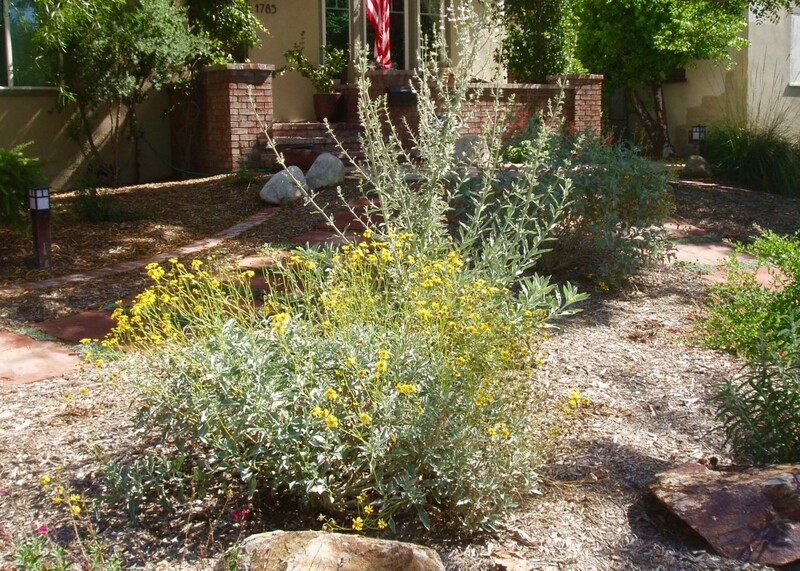 In order to create an attractive, sustainable yard, you must not only embrace the local wild landscape to minimize the extra care that is needed, but also put your plants and hardscape features together in a way that attracts and holds the eye. 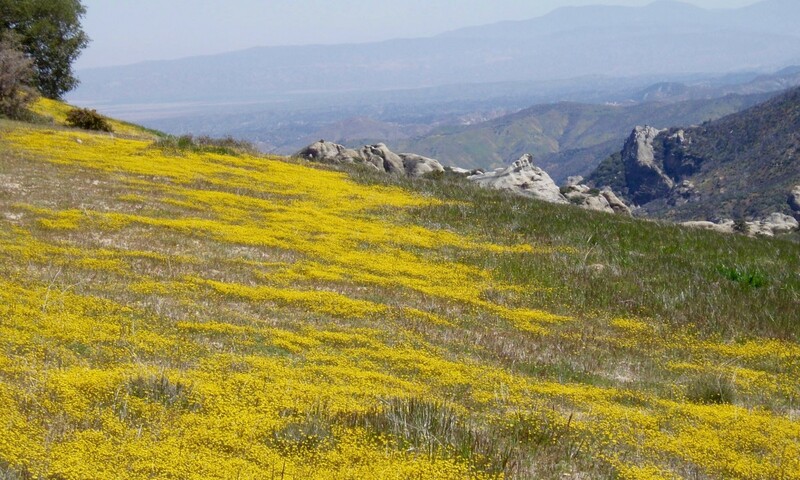 Local wild landscape features include the general shape of the land (flat, hilly, mountainous), the weather, water availability, and local native plants––whatever you find naturally existing in your area. 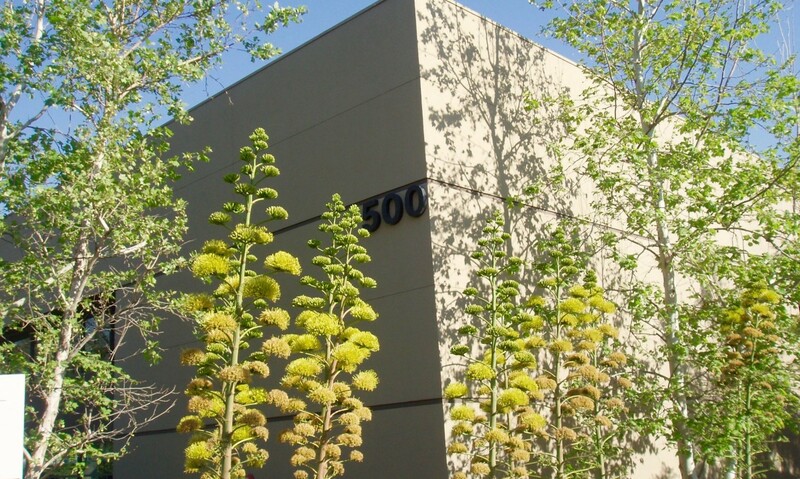 An attractive, natural-looking landscape matches these and is relatively easy to maintain. Design elements include color, texture, scale, line and more. 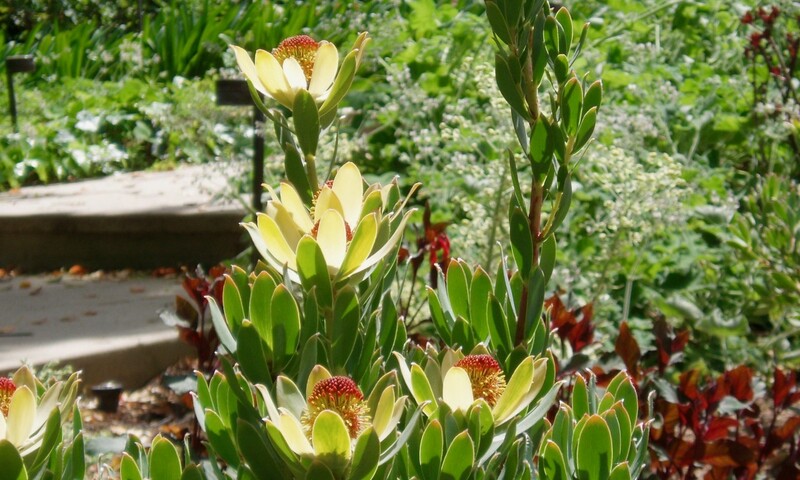 Using design elements in your plan is what makes a natural garden attractive. Color––mixes of contrasting, complementary, or same color shades and hues. 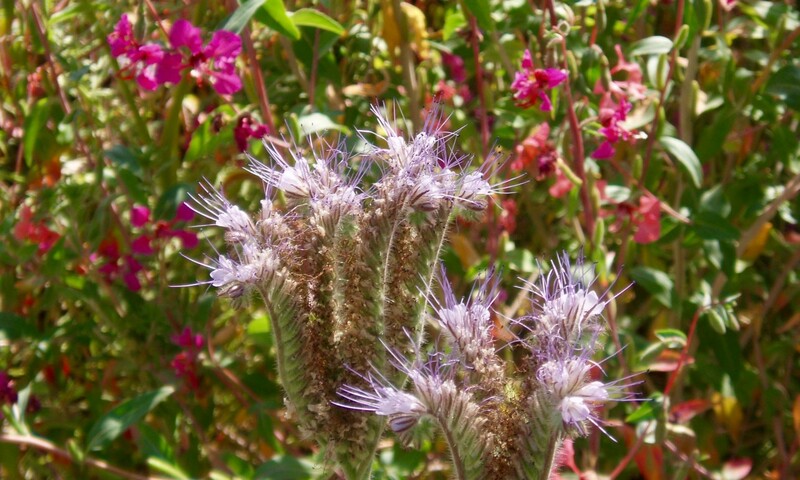 Texture––mixes of soft, rough, frilly, thick, round, pointed, fuzzy leaves, bark, or petals. Scale––sizes tiny to large, short to tall, single or en masse. Line––leading the eye from here to there, whether curved or straight, vertical or horizontal. Focal points––particular views from different locations. The following sections describe more about each of these elements and show photographs that illustrate them. If you have questions not answered here, feel free to ask them in the comments section below. 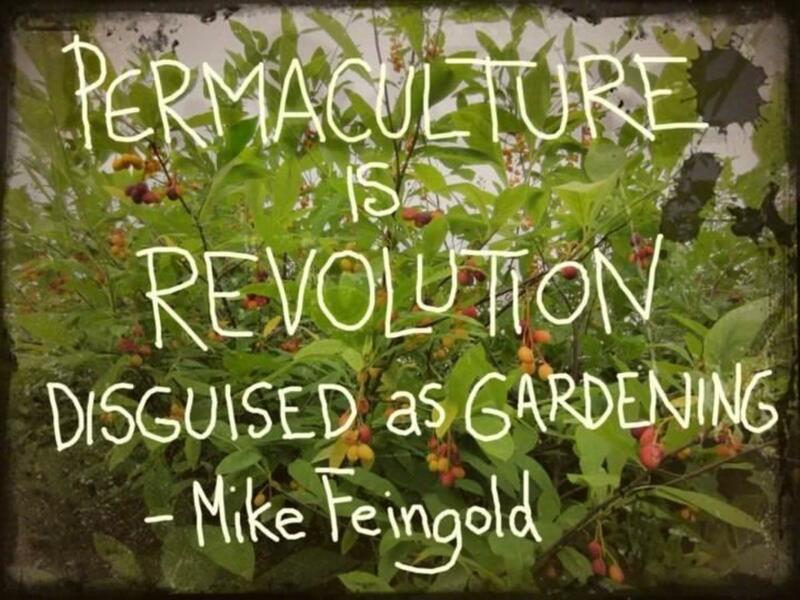 When you walk by a landscape and glance over, you don't see just individual plants, but the entire garden. 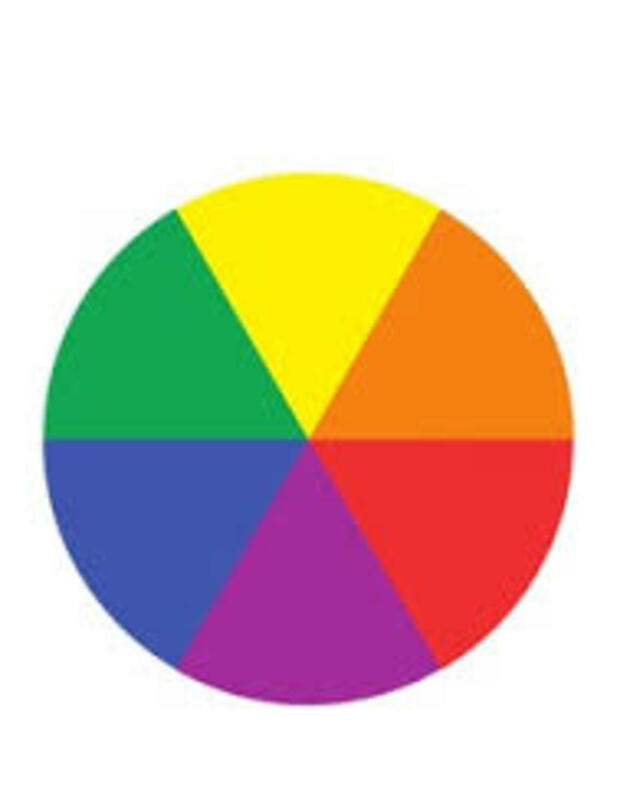 You see how the different colors play off of each other, or reflect the house colors, or blend or not with the neighbors' colors. 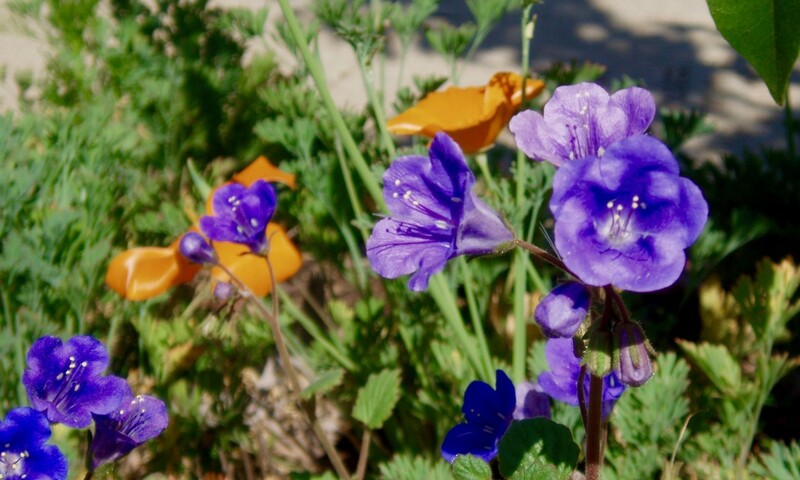 Soft purple flowers with blue-green leaves can look gorgeous next to bright yellow flowers, giving contrast to each. 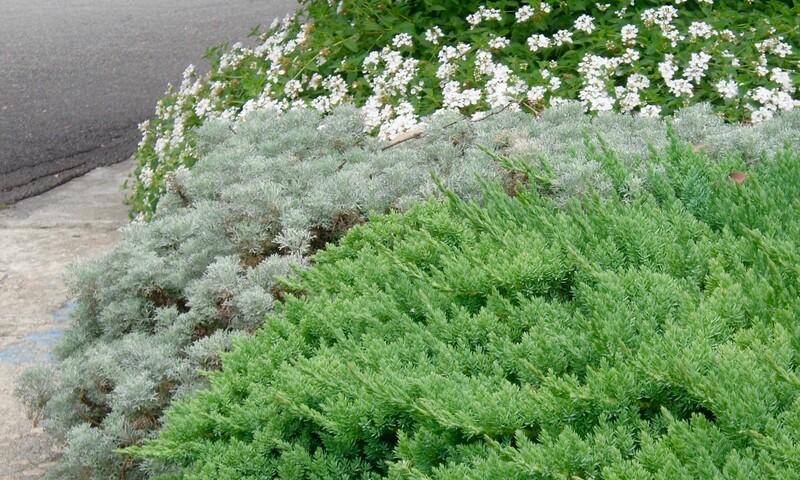 Masses of small, delicate white flowers can enhance a few large, showy white ones. A whole slew of pinks, or combinations of pink next to purple colors can be soothing and attractive at once. Purple, green, and red leaf colors can be mixed to good effect. And colors that change with the seasons can attract attention year round. 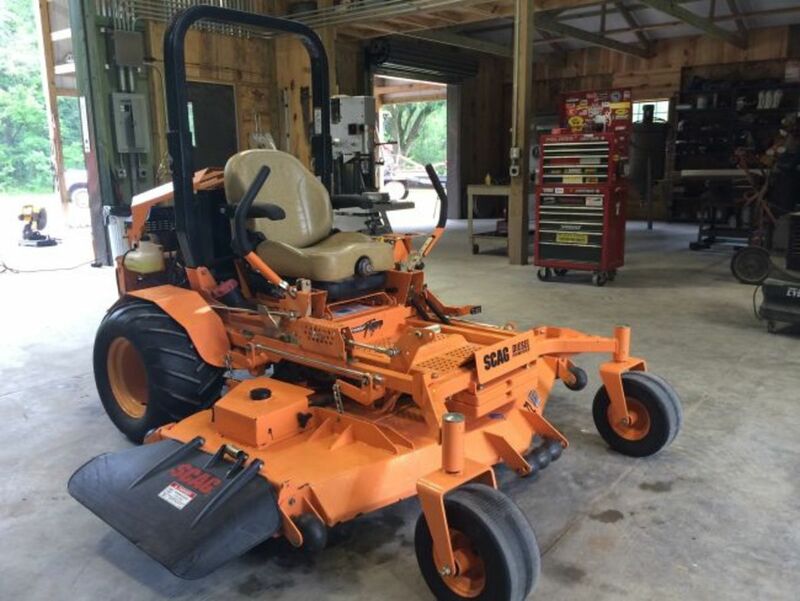 You can have your garden change completely season to season by planting different colors for different seasons––like pinks in spring, whites in summer, yellows and oranges in fall. Using many colors, you can play with variations of the same theme, such as multicolored roses all in one spot, or red ones next to pink ones next to white ones as the eye goes from prominent to more distant beds. 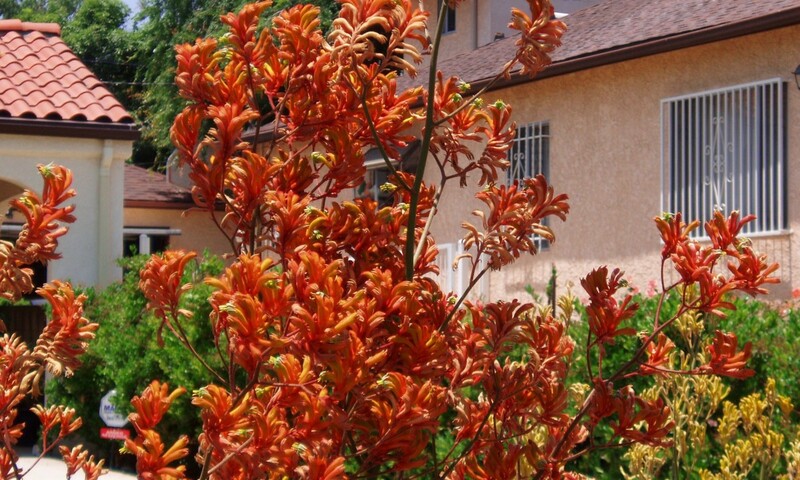 You can take a house that is too dull and brighten it up with intense, warm hues of flowers and/or leaves (like orange or red). Or tone a brightly painted house down by surrounding it with soft, cool colors and leaves (like blues and greens). You can make a space that is too small look larger by planting dark, intense shades in front and bigger, lighter colors in back. 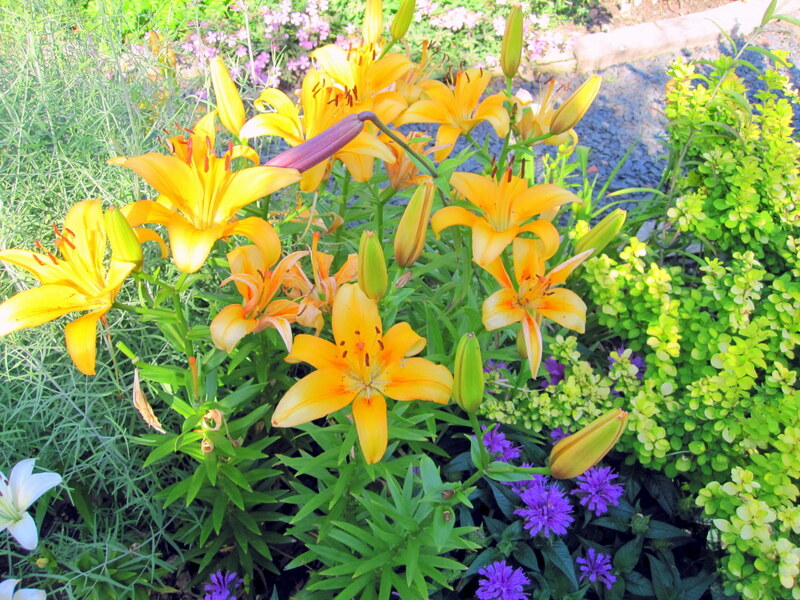 Or shrink a too-large yard by doing the opposite––planting bright flowers in back and lighter, softer ones in front. Texture is smooth vs rough, frilly vs thick leaves, fuzzy vs. smooth. Each shape plays a different role in nature and will be found naturally in different types of environments. For example, in the desert you'll find a lot of thick, fat, fleshy shapes protected by sharp points. 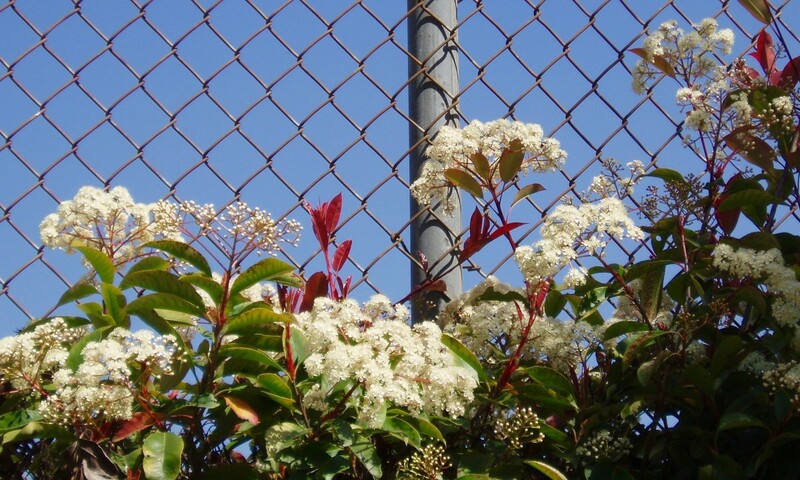 The points stop animals and birds from accessing the water stored by that plant within its stems. In the tropics you can find mostly slick leaves that let excess water slide off, or tiny ones that let excess water fall through the spaces. Rough bark helps collect water and hold it for the use of insects and birds, or for arboreal plants whose roots search for such spaces. In the planned landscape, whatever contrast in textures is used will work best (generally) if also found naturally in that area. 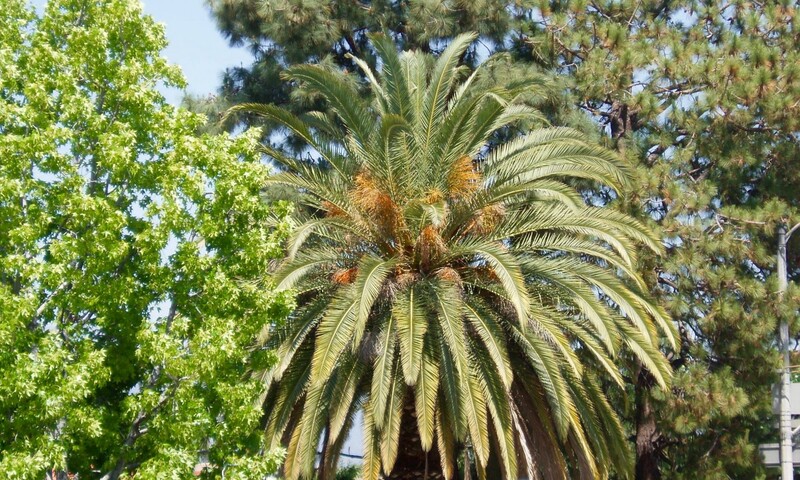 In Southern California you can find different textures together like the smooth leaves of ivy or frilly vines of asparagus ferns climbing the rough bark of trees. In Florida you can find a combination of textures in the variety of ferns and water plants located there. The relationship between plants and their surroundings is called scale. Small houses can be overwhelmed by too many large plants, whereas a large house would look silly surrounded by tiny plants. Scale is large sizes contrasting with small, tall contrasting with short, small leading into bigger and then bigger. Scale uses size to lead the eye up, down, close, or far. 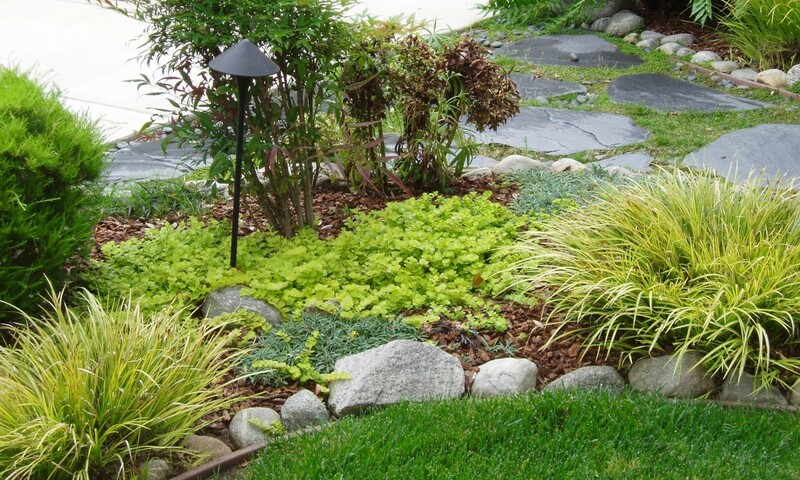 You can use masses of small plants to expand the size of a yard, or masses of large ones to decrease it. 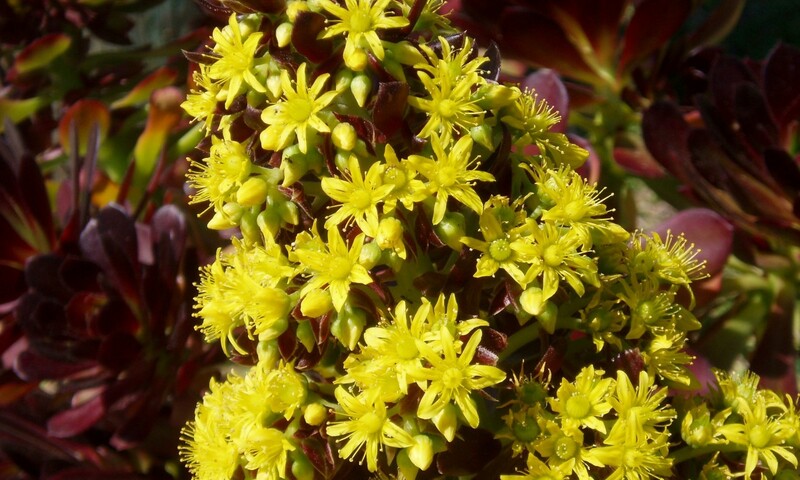 Masses of small flowers will make sure they're seen, or use just a few large bushes to create interest without dominating your yard. Is it a wealthy neighborhood with lots of space? 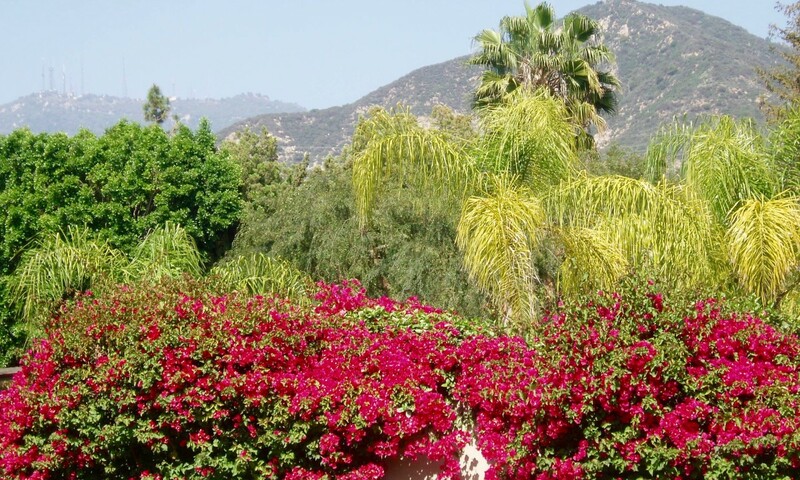 Use primarily big plants––trees and colorful bushes that stand out. 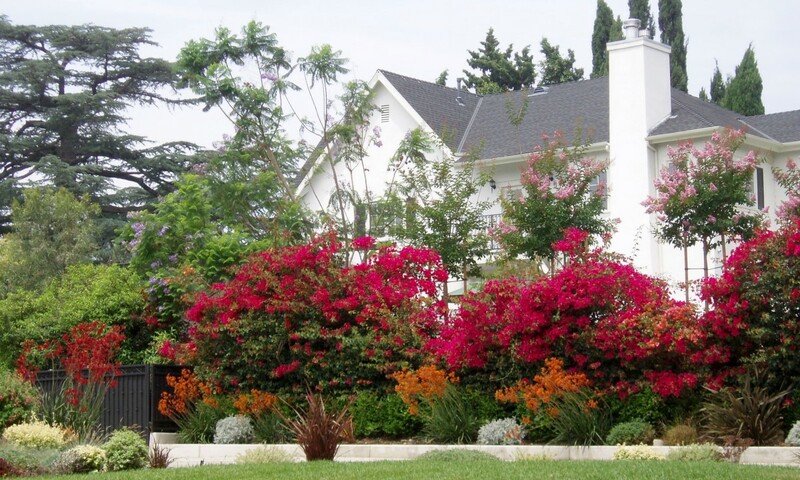 Add a few large flower beds to enhance the color. Is it a neighborhood with medium houses closer together? 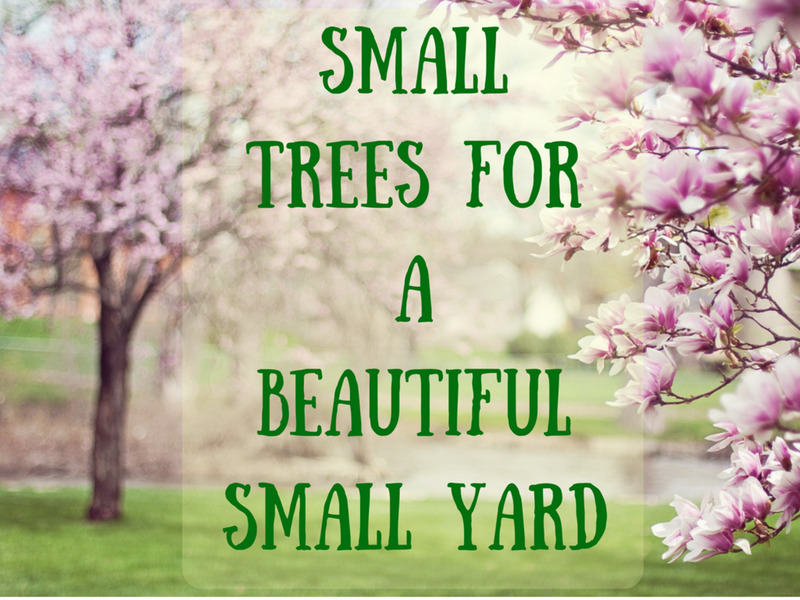 Use a few smaller trees enhanced by smaller flower beds, or a few flowering bushes with lawn or gravel between to create space. 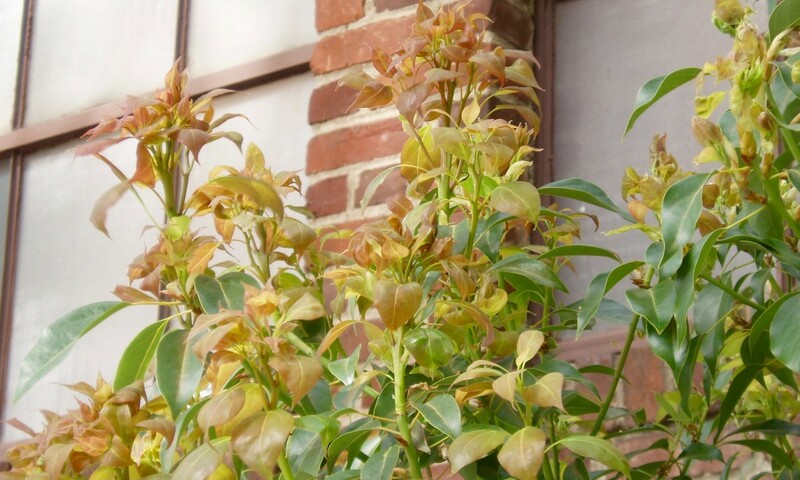 Plant brighter colors in front and lighter ones behind. Is it a neighborhood with tiny houses and hardly any yard? 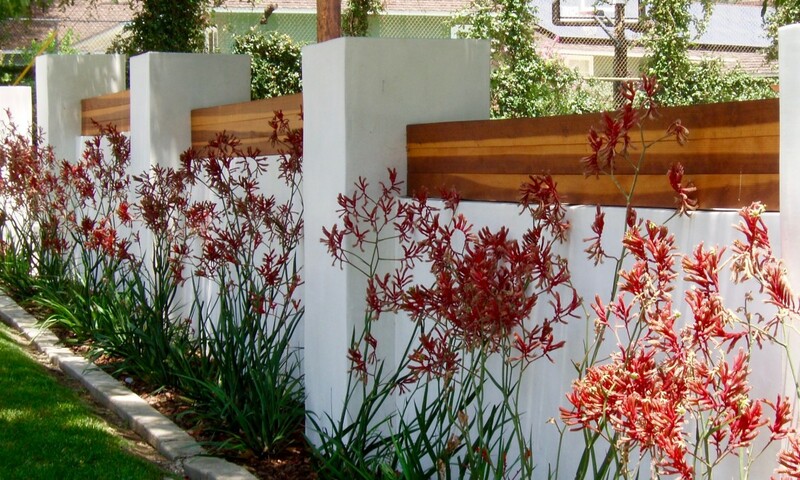 Pretend that your neighbors' landscapes are an extension of yours and design yours to blend in. 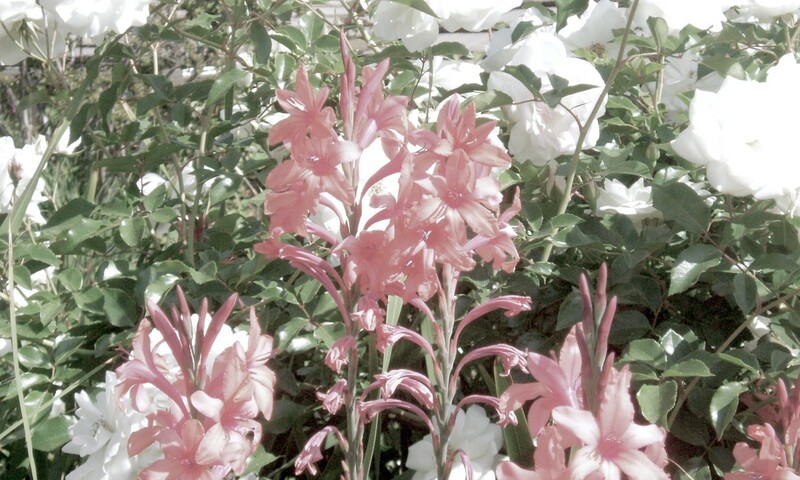 Use smaller versions of the same kinds of flowers as theirs, and choose colors that match their houses and/or yours. Line is one thing leading to another, leading to another, leading to another. Lines can be vertical as well as horizontal. You can use lines to enhance the shape of an object, like growing ivy up a tall eucalyptus tree. Or you can use them to lead the eye to places like doorways, or direct the eye away from places like the compost pile. 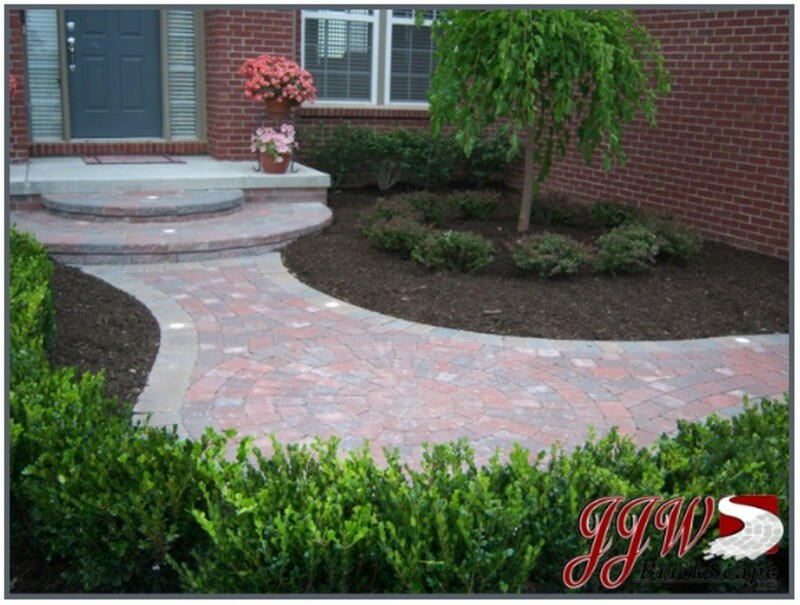 For a more casual garden you could build sidewalks, place rocks, and locate plants in a meandering, curving pattern to create line. 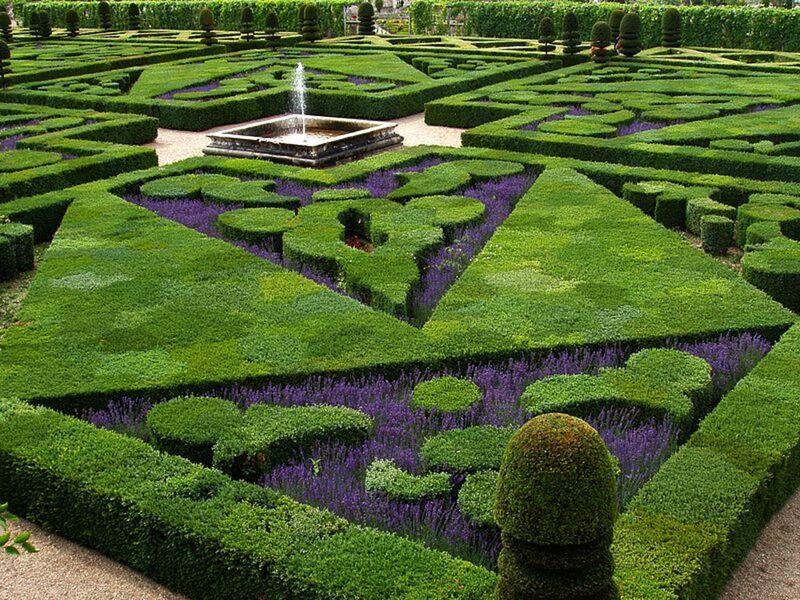 For a more formal garden, you would plant or build in straight lines and sharp angles––often including darker leaved bushes and trees that can be sculpted. All of the above elements can be combined judiciously to create special focal points at different times of the year in any landscape location. They can also be used to create a blend or dissonance with neighboring landscapes - an overall harmony or contrast. I saw a business yesterday that had purple flowers growing up toward a neighbor's pink bouganvillea hanging over the fence. It looked very attractive. 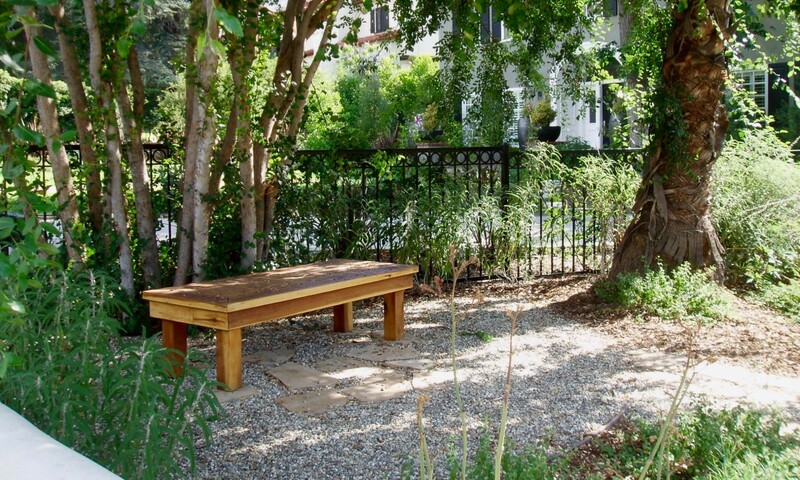 Focal points help create purpose in a yard. Instead of just a bunch of flowers sitting there at random, you can direct the eye to notice a swing or hammock under the tree. You can emphasize the front door or a path leading around to the back. You can set up a cozy corner with a bench near a bird fountain. You can make your focal points visible from the street, from the middle or side of the garden in a large landscape, or from the inside of the house looking out. It's a good idea to sketch out several patterns on paper (or using landscape design software) to see what they might look like in reality. Even more fun would be to photograph attractive bits of others' yards, print the photos, cut out the best parts, and arrange them in a landscape collage you can duplicate in real time. However you choose to design your landscape, its ultimate attractiveness will depend on using these landscape design elements in a conscious way. 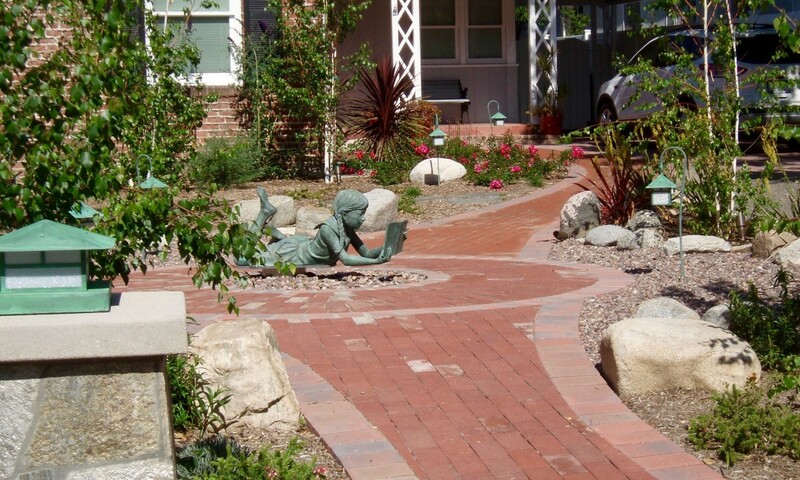 What have you seen or how have you used these elements in your landscape design? Be sure to let us know in the comments section below.